2. Sweet, right? 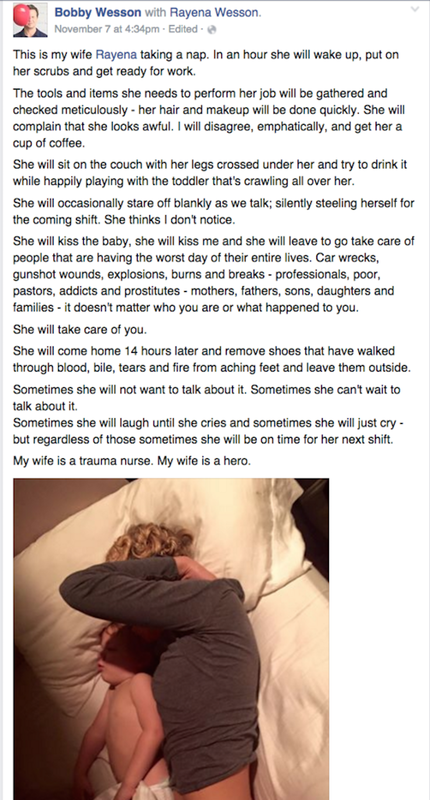 The exhausted trauma nurse sounds wonderful, agreed? Yes. 4. Did your feelings about the trauma nurse change? If not, congratulations! You are an enlightened feminist. Hit the showers. 5. If you thought somewhat less of the nurse, or found the spouse’s view more trustworthy, why? If her high self-regard seemed immodest, couldn’t she be proud of her work and also politely humble in her personal life? Does pride in her professional aptitude or heroism reflect poorly on her? Would that be true for a male narrator? 6. Did you value the praise more — give it more weight or credibility– because it was from a man? 7. Re-read it again, but now identify the narrator as a woman, praising her co-parenting, heroic, wife. 9. Did that restore your esteem for the nurse? If not: are you devaluing the woman’s voice because of sexism or homophobia?